Ulysse Nardin produces some the worlds most complicated Minute Repeaters. This is a Platinum, Triple Hammer Jaquemarts, rings the hours, quarters and minutes. 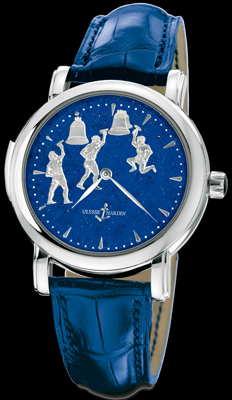 The dial is crarted from the finest Lapis Lazuli dial. It is available on elegant blue color crocodile leather strap with platinum folding buckle.